Save 25% on the medieval romance novel A Knight of Honor by award winning medieval romance author Laurel O’Donnell. 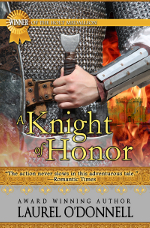 A Knight of Honor was the winner of the Holt Medallion Award for Best Medieval Novel. The special sale is being offer on AllRomanceEbooks.com for two weeks only, starting August 1, so take advantage of this deal while you can. This entry was posted in Blogs, Events, Promotions and tagged a knight of honor, special offers. Bookmark the permalink.